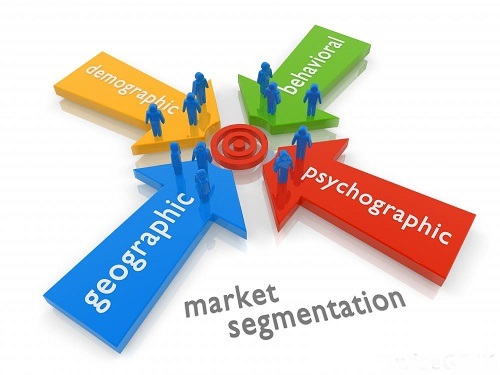 Market segmentation is a process in which we divide the whole market into different segments of buyers. Each segment is distinct from the others and is comprised of people with similar needs, preferences and buying capacities. They respond in a similar way to a new product and service or to any market fluctuation. The market is divided into different segments of buyers on the basis of geography. There are mainly three geographical variables for geographical segmentation. First is region or location that includes village, town, city and country. Second is population density that helps focus on densely populated regions. Third is climate that helps to focus on regions with similar climatic conditions. Demographic segmentation is based on demographic variables which are easy to identify such as age, gender, life cycle, income, race, religion and nationality. In psychographic segmentation, the market is divided into different buyer segments on basis of buyers' social class, life style, attitude, interest and opinion. Behavioral segmentation is based on the variables that represent buyer's behavior. These variables can be buyer?s response to product, attitude towards product, buyer status, buyer loyalty towards a product and buyer usage rate.